I will say that there WAS one company that had put together a very slick looking video with the concept of having an app that would actually allow us to handwrite music on our iPads. That video was THE hot topic for awhile – let’s see now… what was the name of that company again? Ah, never mind – it never came to be from them. Now, Neuratron has done it all again! 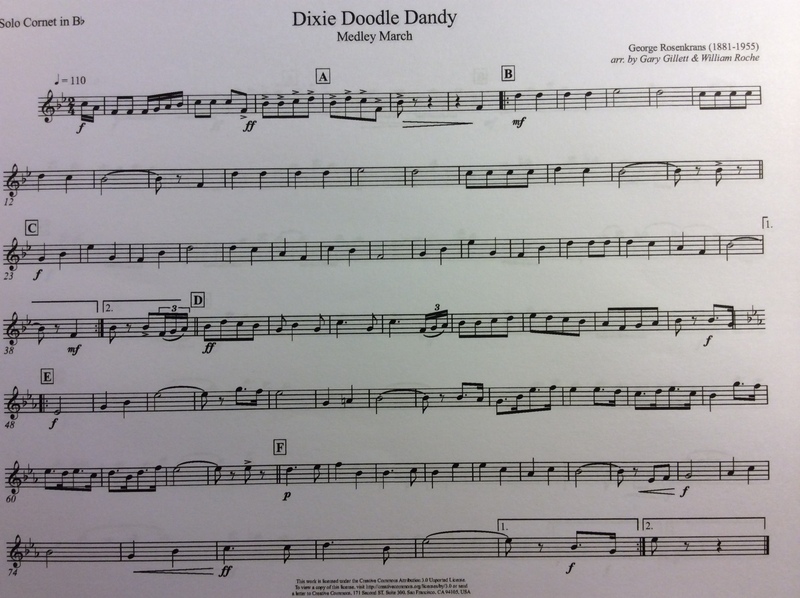 They released a plugin to NotateMe that allows you to take a picture of printed sheet music and it will then take that picture, perform magic spells on it and then turns it into a computer notated file! (OK…. it’s not really magic spells but it seems like it!) That plugin is called PhotoScore. As you can see there were not MANY missed notes in the recognition! AMAZING! LOVE IT, LOVE IT, LOVE IT! This scan has the most amount of errors that I have gotten so far. I’ve done quite a few and usually there is only one or two missed items. In this scan you can see that there are some dotted 8th-16th note rhythms that the scanning process missed along with a couple of ties. Here is a link to a video which shows you how awesome NotateMe Now is at this whole process! In the video you can see how crazy easy it is to edit the errors in the piece from above – it took me just 3 minutes. Most of that was simply looking back and forth to make sure the app didn’t miss anything. 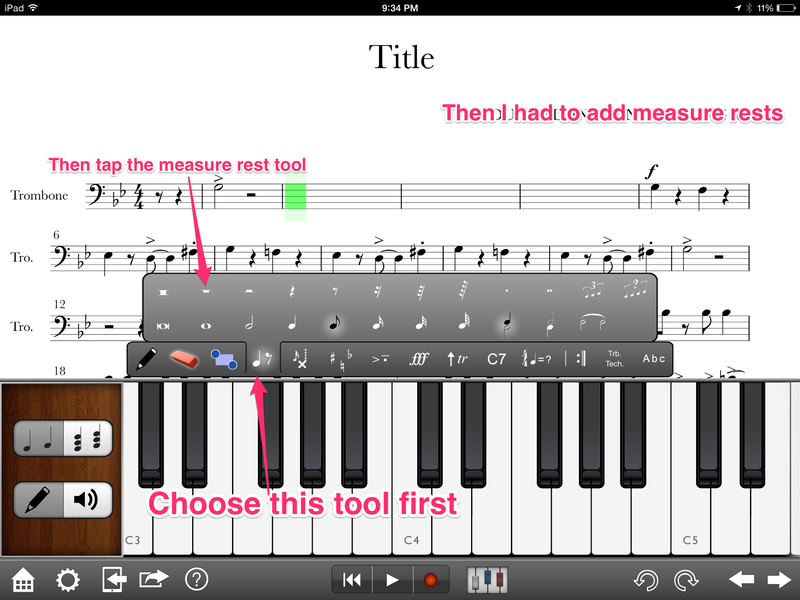 Below I take you through a few steps working with the NotateMe Now app, Notion for iPad and Sibelius on a laptop to get to a final product. So here are the steps I took to clean things up…. I COULD HAVE emailed myself an XML right from NotateMe Now and imported it into Sibelius on my laptop BUT this is about exploring the capabilities of what my iPad can do. So, I choose to use Notion for the iPad. Let me show you what I did…. 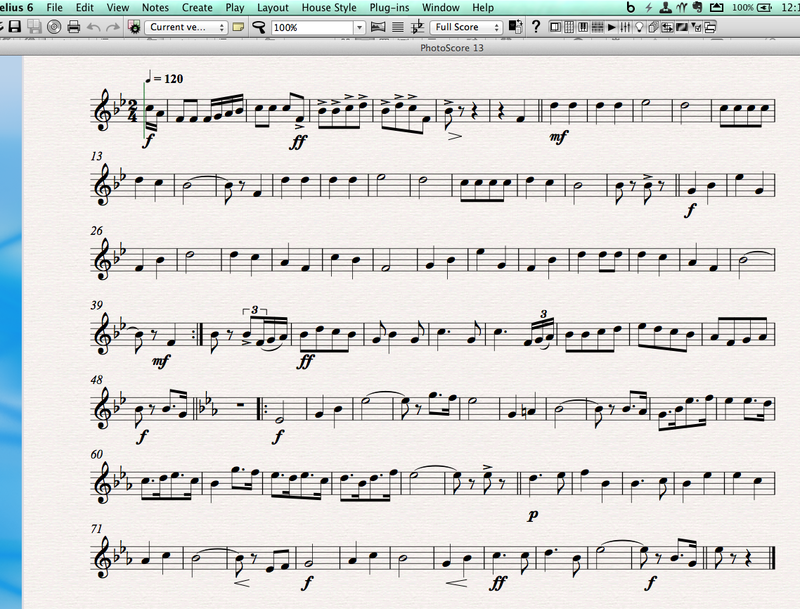 Re-named the Part (This seemed to help later with transposing instruments especially! Found the correct file (I did not think this worked the first time. I expected Notion to actually pop open the file and it does NOT do that. It puts the file in the list and you have to open it yourself. I then edited all the articulations in Notion – I feel like it is faster on the iPad then in Sibelius (and I’ve been working with Sibelius a really long time – I even have shortcut set up to speed up the process. 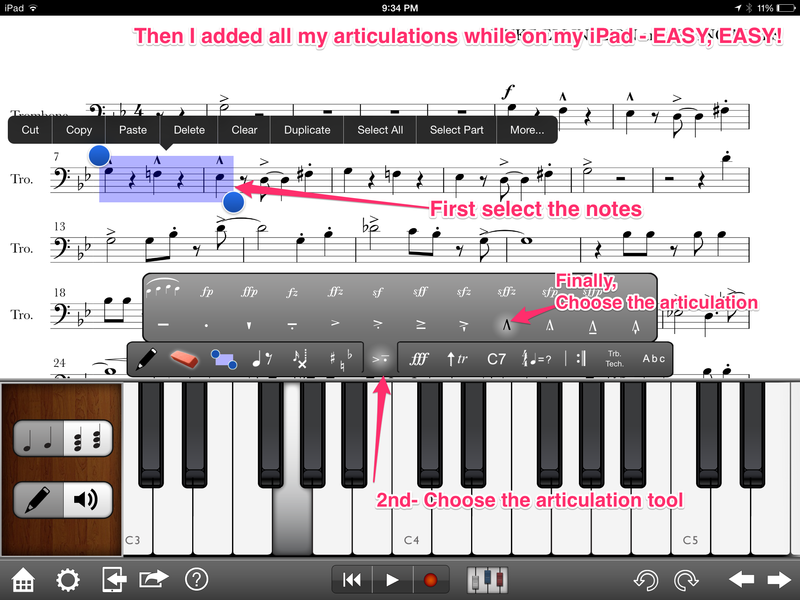 I just feel like it is way easier to tap the note, tap the articulation – done.) Don’t forget – when there are multiple notes in a row that need the same marking you get them all at once! 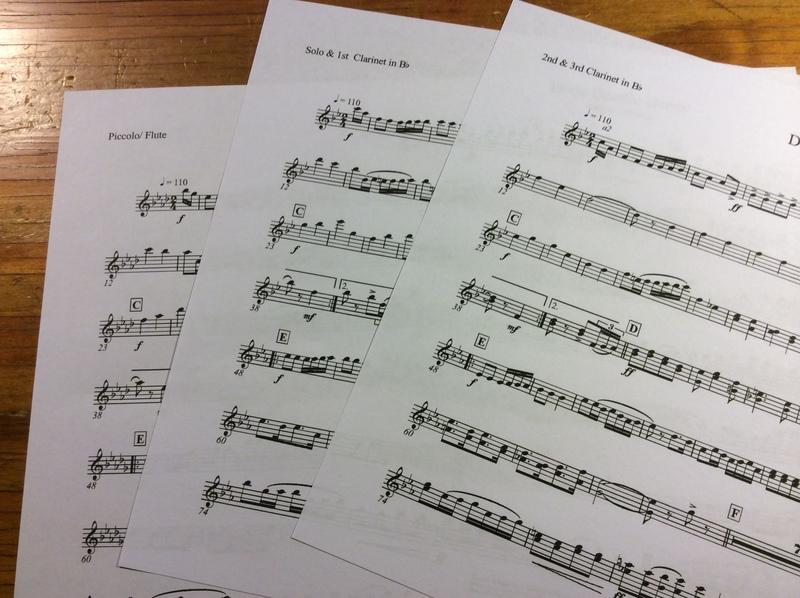 Once in Sibelius I only had a couple of things to do – I had to work out the transposition. This was tricky…. I’m still not sure if this is me or the apps. Sometimes things worked out fine – other times I had to use the up and down keys to get the notes in the right spot. I’ll explore this issue more and write another post about it. HINT – The one thing I DID figure out is that I needed to have the correct name for the instrument right from the get go – that’s why I renamed the part in NotateME! So what did I have to do in Sibelius? I moved the dynamics into the correct spot BELOW the music and I reset my beam groups – you can see in the pics below that for some reason those 8th notes got really messed up some place in all the transferring between NotateMe, Notion, XML, and then Sibelius. A couple of clicks though and it was done. 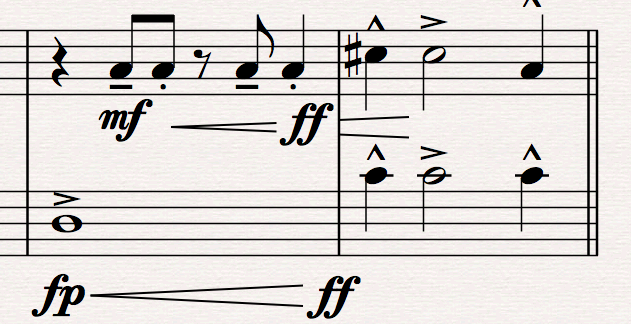 Added the crescendo between the FP and FF that Notion would not allow me to. I’m not done with all the parts yet – I was to excited about how well this worked! I had to share with all of you! Why even bother with this process? Imagine being able to give a student an assignment to learn a piece of music. Now, with this technology, if they have questions about how the music is to sound they can scan it and end up being able to hear the rhythms and pitch! How about if a student wanted to write out a duet part? Well now that process is going to be much faster – they scan the first part, add a second part, copy the easy sections where maybe they just need to raise or lower the part a 3rd, add in the other sections where it takes a bit more rewriting and then print! Plus they can listen to it as well! What if your band has no tuba players? Take the tuba part, scan it, change it to marimba and give your percussion something else to do besides hit each other with their sticks! The only reason that I actually even used Sibelius at all is because I am still using the free version of NotateMe Now which only scans single stave music. 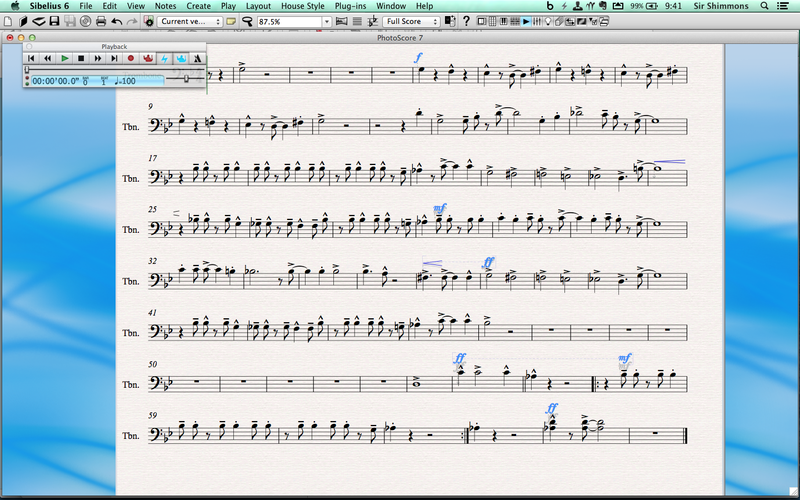 I am currently working on all my marching band music and trying to get it digitized. Of course one reason I am doing that is so that the students can do SmartMusic testing on our marching show music when we get back to school in the fall. So for every instrument I repeated the above process. Eventually I will end up with all the parts in one Sibelius file, all without hardly ever having to input anything by hand or playing it in with my keyboard. Let me assure you – this does NOT take as long as it may seem. It takes a few times to get the hang of the process but after doing 3-4 you will be much faster at it all. In the time it took you to read this blog post I probably worked through two more parts. For this entire Blog Post whenever I referred to NotateMe and PhotoScore, I used the free version of NotateMe Now which gives you the ability to work with a single staff for FREE! So you get the ability to handwrite music on a single staff for free AND the PhotoScore capabilities for single staff music for FREE too! Good enough for music students to make great use of in class and in lessons. 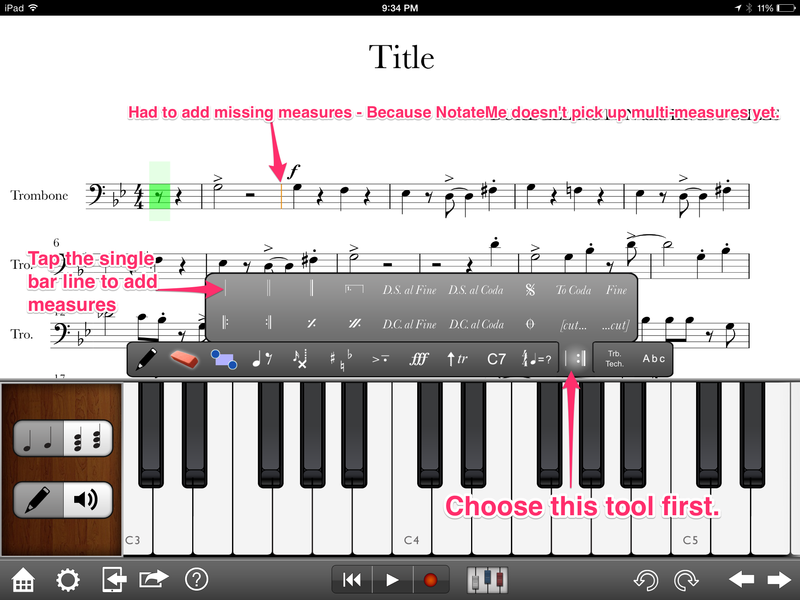 The full version of NotateMe is $39.99 – Yup, I know, someone just choked on their gum. For an iPad app it seems expensive. For what it does it is not! The In-App-Purchase to get the PhotoScore Plugin is another $29.99 – Let me put this in comparison for you though – The actual computer app that does the SAME thing is $249! Plus, I’m telling you, the iPad version is BETTER! Also, please make sure that you read about which devices are supported, especially for the PhotoScore app. This technology astounds me that it is even possible on a mobile device! It should not astound anyone that PhotoScore requires a camera that is of higher quality which means the iPodTouch 4th gen, iPad2 and iPadMini 1st gen are left of of the loop for PhotoScore. I mean, come on people, this is replacing a scanner for goodness sakes! Using Notion’s iPad app ($15.99) to edit the files was a joy! 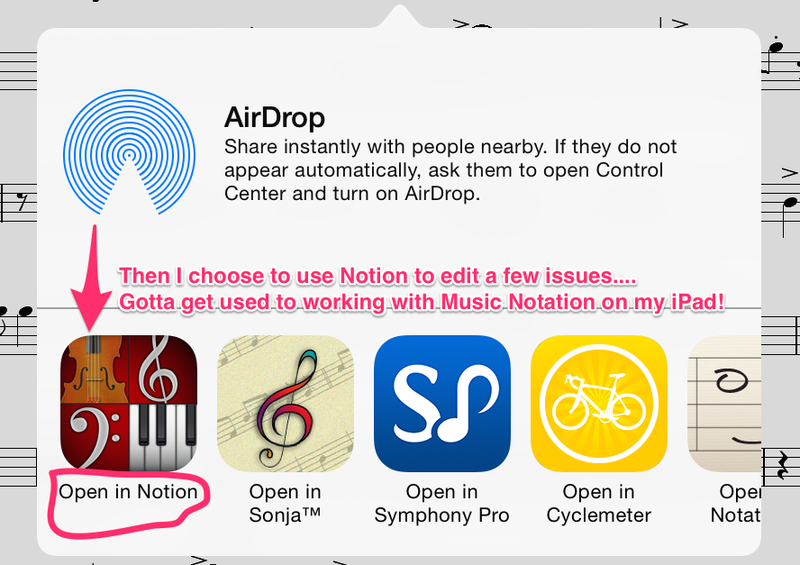 This app is not for those of you with only a 16GB iPad though – Notion by itself takes like 2GB! That’s because of the awesome sampled musicians from the London Symphony Orchestra that is crammed inside of you iPad when you purchase Notion. HINT – If you are a saxophone person you will have to spring for the $1.99 in-app-purchase to get that Alto Sax sound! Same for the Tenor and same for the Bari Sax. You will get a great basic set of sounds with your original purchase of Notion but for some STUPID REASON they don’t include saxophones in that set! I HOPE NOTION IS READING THIS AND CHANGES THAT DECISION! Or should I just talk to PreSonus? HELP SUPPORT THIS BLOG PLEASE! All the links from my blog posts are affiliate links. What that means is that if you decide to purchase one of these apps by clicking on the links I’ve provided then I get a small percentage of the sale. The developer’s get their portion still but I get a small (very small) portion of Apple’s profit. If you appreciate the tips and ideas I share with you and you decide to purchase the apps mentioned anywhere on my blog it helps me to keep going. Thanks for considering the possibility of clicking my link first then purchasing the app from the store. 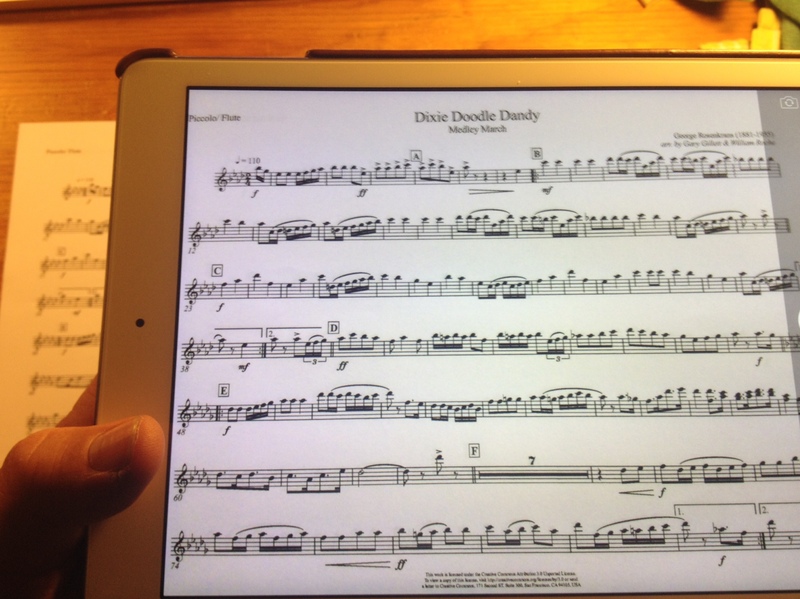 Previous Want an app to help make reading Sheet Music easier? Great article! I’m very excited for the PhotoScore possibilities! And I jumped on NotateMe when it was in beta for like $16, so I’m happy with the development. One question, and I know you were exploring the iPad capabilities. But, you ended up going to Sibelius anyway on the desktop. So, I’m thinking a simplified workflow would be to scan the score (in the full version of NotateMe), import to Sibelius to clean it as a score, and export parts. Isn’t that easier? It was easier when I did the perc parts to go straight to Sibelius. My real question is if we can do without the laptop? How do you go from Sibelius to smartmusic I thought you had to use finale? You are correct about having to go from Finale to get music into SmartMusic. 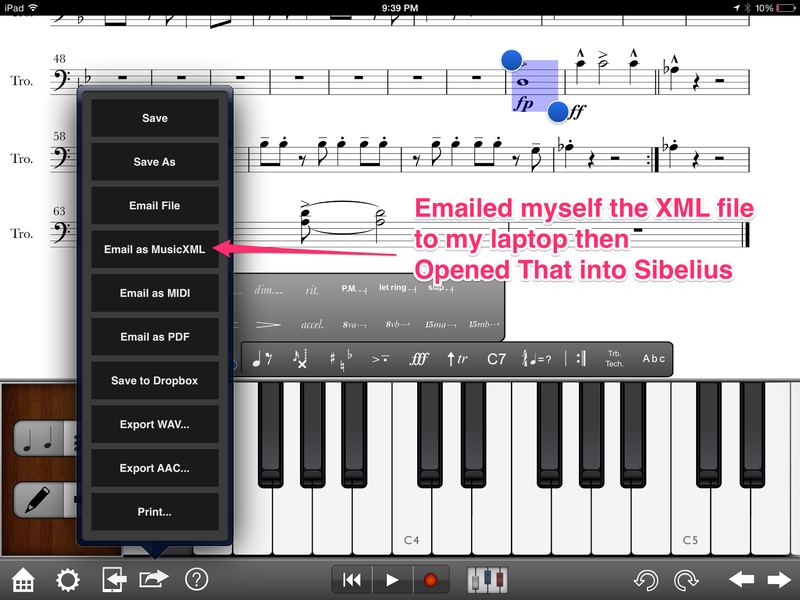 I have both Sibelius and Finale just because of that functionality. I really like the workflow in Sibelius so much better and I can get my music into Sibelius about 3 times faster than what it takes me in Finale. That’s not because I have not used Finale either – I started using Finale first, back in the days when you kept 3 manuals next to your computer just so you could figure it all out! Thank you for this wealth of knowledge. I will definitely support your blog and click on the links for purchase. I am confused about this sentence: The In-App-Purchase to get the PhotoScore Plugin is another $29.99. I am not quite sure what that means. Can you please explain? Sorry, I tried to figure it out, reread your article a couple of times. I appreciate the clarification. I already use Finale and do lots of composing. My students use the iPad as part of enrichment required each week so I am using lots of different things but want to add this in to my program. Thank you for your help. This is awesome!!! Thanks for reading about all my adventures and explorations! That is the best way to learn all this stuff you know – explore and play! OK – the price for “NotateMe Now” is FREE and that price includes PhotoScore BUT you are limited to one line of music/one staff. 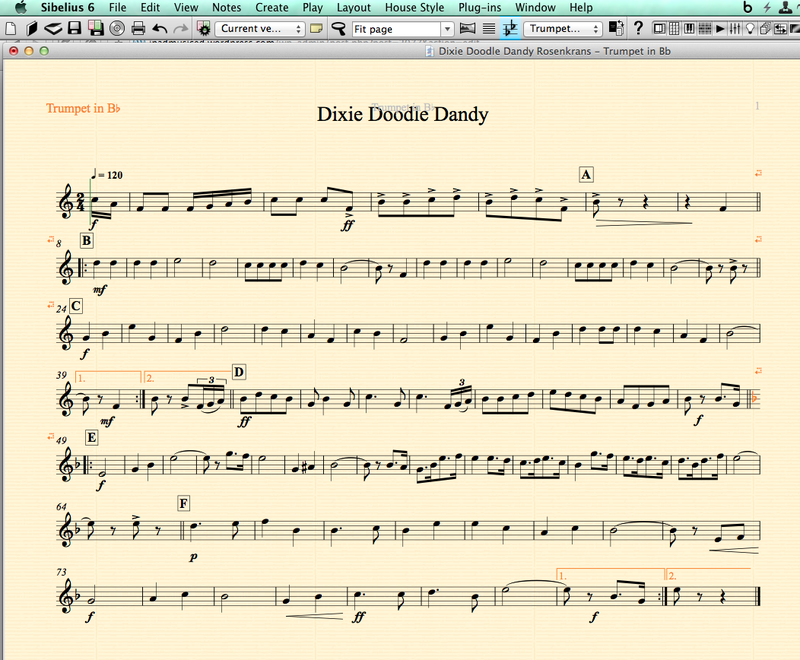 So you would be good if you are writing out just a melody or just a trumpet part for instance. The price for “NotateMe” is $39.99 BUT if you want to do the scanning part then there is an In-App-Purchase for PhotoScore that will cost another $29.99. This gives you a full version of both functions – the handwriting PLUS the scanning. 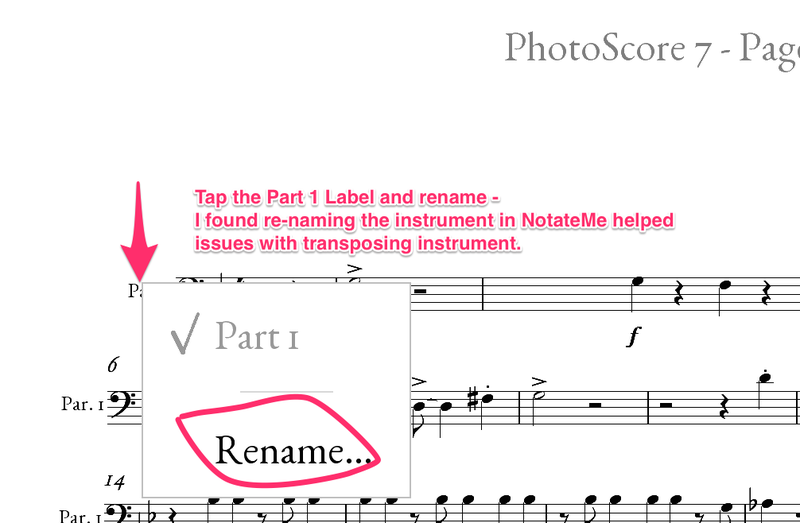 NotateMe and PhotoScore are really like two apps inside of one. 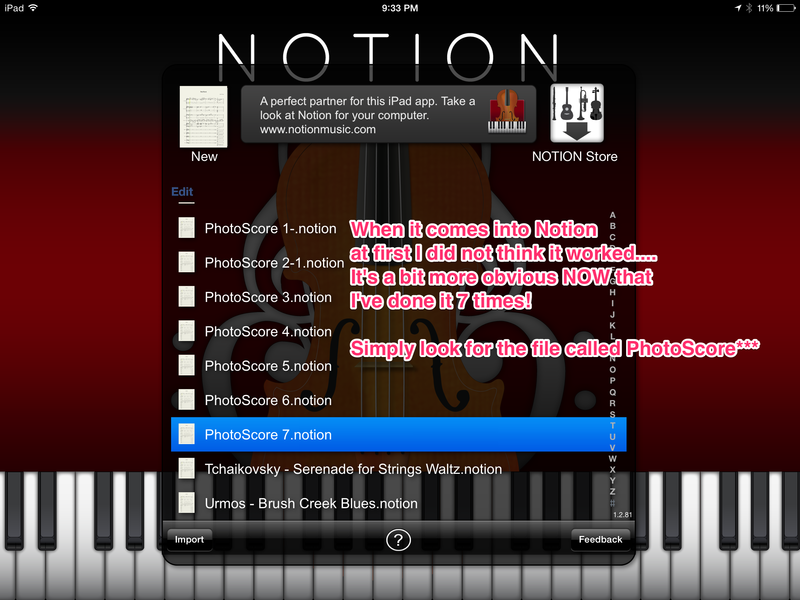 You start with NotateMe and then add on more functionality with PhotoScore. Does that help? If you are still confused let me know and I can do a quick video that may help. 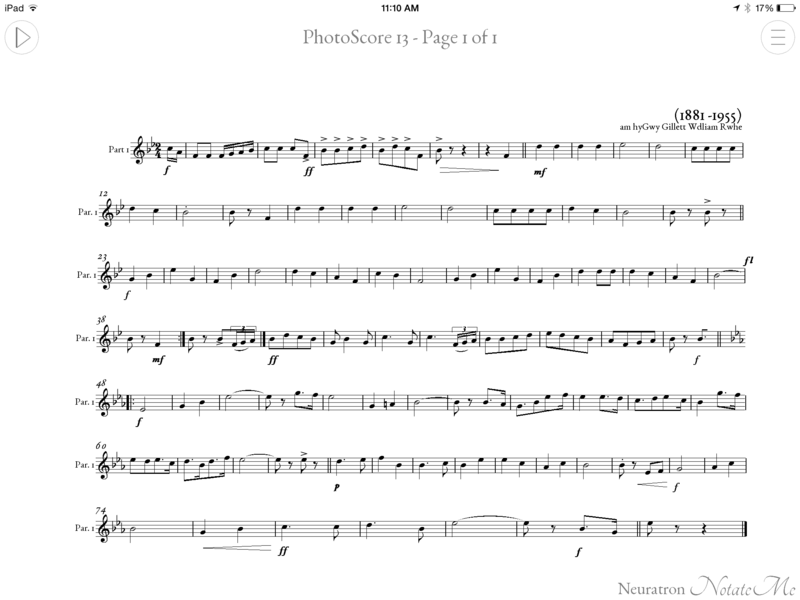 We’ve been using NotateMe at the Chichester Music Press since it was in beta, and Photoscore within it for the last several weeks. It’s working very nicely for us. It’s astonishing that an app can even begin to do things like this, let alone do them well. Hats off to Neuratron. I agree with you Neil! Astounding that last year at this time we had to use a full fledged scanner and a regular computer to achieve this same outcome! Now, it’s $70 worth of an app with an iPad WHEREEVER we want! Glad to know it is working well for you guys too! Glad to have you discover my blog – hope you can find ideas here to help you out in your journey of using tech to create and manipulate music! I’m a middle school choir teacher and I wonder how photoscore would work with scanning a choral piece? If it was for a 2 part piece, for example, you’d have a total of four staves. Top two lines for voicing, bottom two being the accompaniment. Would this app be functional for that? Know this comment is two years old now, but I am also a choir teacher and am interested in scanning (or taking a picture of) a choral octavo and creating accompaniment and rehearsal tracks for my students. Would this program work for that purpose? Yes it will! It is very accurate. Not perfect but saves a TON of time! If you have multi measure rests you need to be careful because it does NOT recognize those. Let me know how it works for you. Does is also scan text for singers? I’m looking to scan a piece and completely change it, add a violin part, etc. I’m wondering if this would be the best app for that. Also, will it scan in handwritten music? The specs state that the app will recognize lyrics and it will also recognize handwritten music but personally I’ve never tried it. There is the free NotateMe Now app which scans single staffs. There is the full photoscore on Neuratrons website with a demo version available to download. Hi, I’m looking for an app that can photograph a piece of music and then turn the notes into different colours. My daughter is dyslexic and despite playing the piano for five years still really struggles with reading the notes. I have searched and searched but can only find an app that either photographs or can colour the notes but not both. Any advice, ideas? Using what device is part of the question. I’d use NotateMeNow and snap a picture of the music. Which will then turn that picture into digital notation. Then you should be able to turn that into different colors from there. Like I said though… what type of device? Phone, or tablet or computer. iPad but can you colour it as you describe? I don’t think it is going to be easiest to use an iPad for this job. 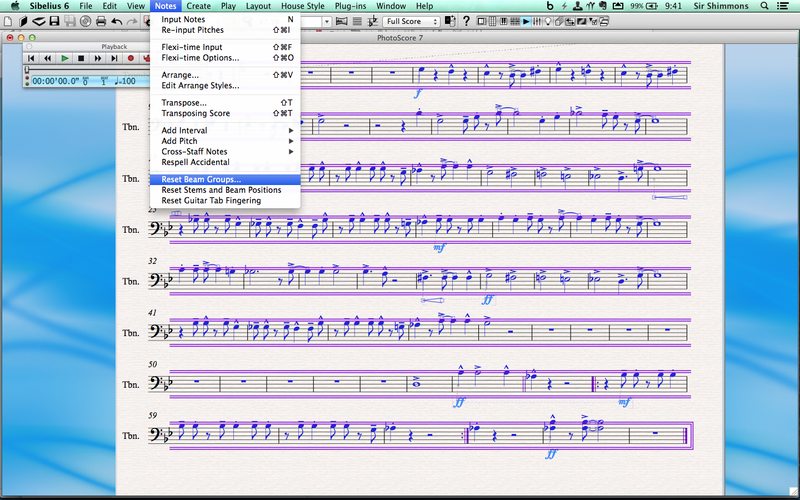 SymphonyPro is about the only app I’ve found so far that will let you set each notehead as a different color. The bad news is that I can not find a way to do this globally. So you have to select each note individually! There might be a way but I’m not finding it. On the desktop Sibelius does the note colors for sure. Hello. 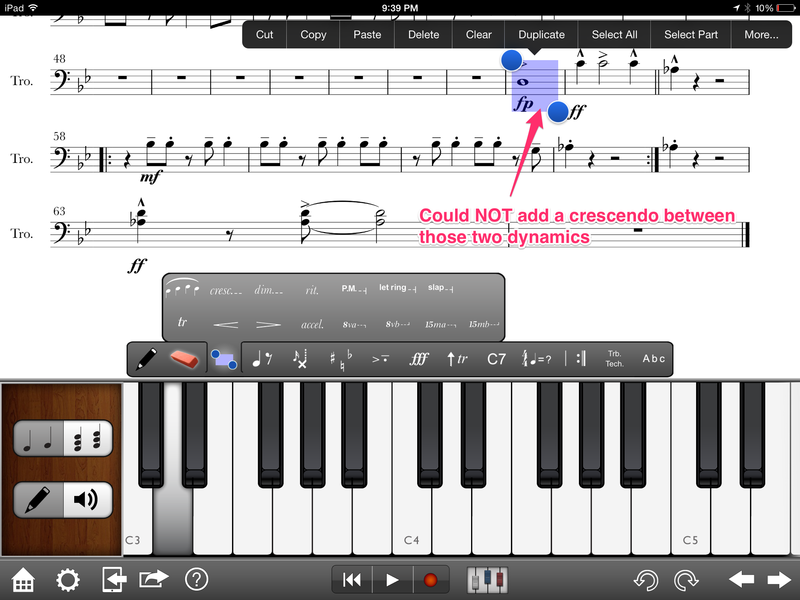 I’m looking for an app for piano alone, for Ipad use only (no PC/laptop apps) that would allow me to scan, edit if needed (to fix scanning errors), and play the resulting sheet. I’ve downloaded a few: Music Scanner, which does a terrible job, PlayScore, which has nice recognition but requires Sibelius or Finale for edit and xml files are needed for more than one page pieces. The goal here is to scan my entire sheet music collection to my Ipad and, organize it, play it back if needed, and mainly follow along on my digital piano, all of this using the Ipad. Adjusting the playback tempo would be a bonus, and limiting playback to the left or right hand alone would also be a big plus. Yamaha NoteStar is great for that, but I have to purchase sheet music from them. I also want to scan my own sheet music. Can you please recommend one that suits my specific needs? Thanks a bunch! Neither app allow for great editing of what the final product is though…. 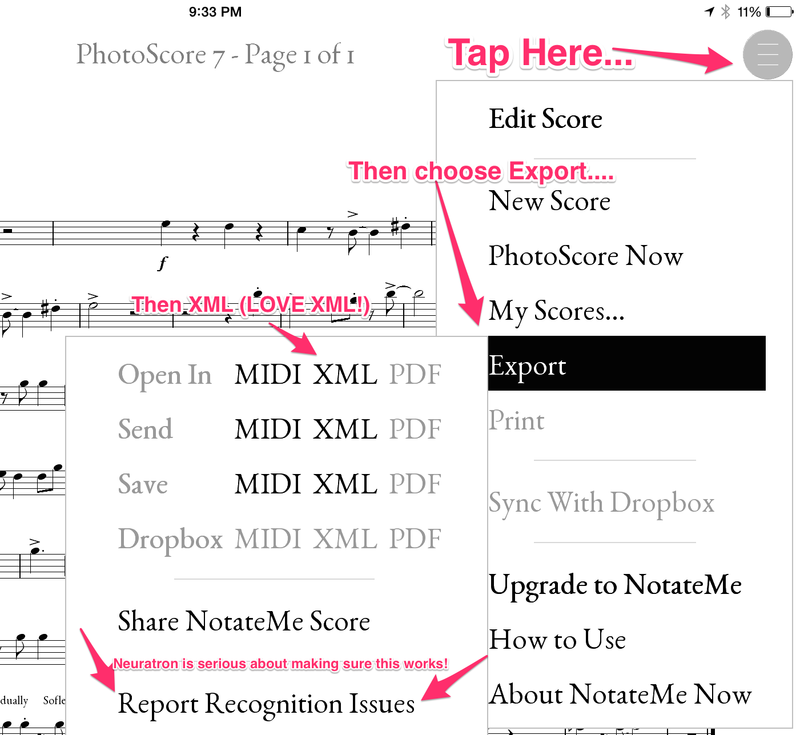 I think that what you really to do at this point is to use NotateMe with the PhotoScore plugin to scan the music and en export that as an XML file into Notion for iOS. That is the quickest way these days using only an iPad. There is no one stop solution currently. You will have editing to do. Good luck. Let us know how you come along with this project! Any tips you have would be appreciated!